Sam was born in the province of Canton and he was the youngest among the Hui brothers. He was brought up in Hong Kong and attended the University of Hong Kong to study psychology. Thus, he was among the first HK actors to receive a tertiary education. In school, he was already a very popular singer and together with his friends, he formed the Lotus in 1966 and signed his first contract with RTHK in 1968. 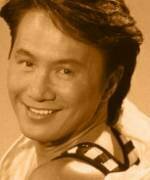 Sam, considered as the father of Canto-pop in the seventies, became early eighties one of the biggest comedy actor. He starred with Karl Maka in the Cinema City productions, the Aces Go Places series (aka Mad Mission), a sort of cheesy James Bond spoof with comedy, action, stunts, romance, gadgets and Canto-pop. This buddy movie between a funky swindler called King Kong (Sam Hui) and an inept detective Kadojak (Karl Maka) was the most famous series of the eighties. Sam provided obviously the theme songs for each episode. Apart from five Aces Go Places films between 1982 and 1989, Sam made very few other noticeable movies. Dragon From Russia and Legend Of Wisely are worth watching though. However, Sam had to stop his activities for a while due to an accident during the production of the Legend Of Wisely. His last noticeable movie appearance was in Tsui Hark's Swordsman (1990). His acting was however not exceptional. The production being late, it was said that Sam Hui was hard to convince to carry on his role after the alleged date of last photography written in his contract. He had actually nothing to prove anymore. Since then, he seldom appeared on the Silver Screen. He made a guest appearance as an old and reformed conman in the 2000 comedy Winners Take All starring Nicholas Tse, Joey Yeung and… Karl Maka. Brother of Michael Hui Kun Man, Ricky Hui Kun Ying and Stanley Hui Koon Miu.